The State Museum of Fine Arts. A.S. Pushkin. Reproductions of hundreds of paintings of the museum. The basis of the catalog is the legacy of two hundred and fifty masters of engraving, including such famous ones as William Hogarth, John Raphael Smith, William Ward, Thomas Rowlandson and James Whistler. Along with individual sheets, the catalog includes popular satirical and landscape series, compositions dedicated to sports and hunting. The electronic edition differs a variety and complexity of the structure. In addition to the famous, often exhibited at the exhibitions of works in it, many remarkable monuments are concentrated, which are published for the first time. First of all, these are unique albums of engravings of "Antiquities Great Britain", "Cries of London" and "Alphabet". It should also be noted the animalistic compositions of Thomas Landseer, John Frederick Lewis and George Townley Stubbs. The catalog reflects quite fully and consistently the main stages of the development of the British print. The first half of the 18th century is represented by the works of outstanding British portraitists John Smith I and Isaac Beckett, the moral and moral series of William Hogarth; The second half of the century - engravings of various genres and directions that arose at this time and fell in love with the inhabitants of Great Britain. William Woollett's landscapes, Valentine Green's portraits, compositions on mythological and religious subjects Francesco Bartolozzi, urban views of Thomas Malthon the Younger - a model of technical and artistic perfection. In these works, traditions and innovative solutions, effective decorativeness and strict classical forms were intertwined. In modern Russia there is no national Gulag Museum. It is absent not only as a material object - it is not in Russian culture as a necessary link between knowledge and understanding, fact and event, experience and memory. The memory of the communist terror did not become an integral and integral part of the national memory, it is still fragmentary memories of local events that are not connected by a common conceptual essence. This is the state of memory demonstrated by existing museum collections and exhibition projects. 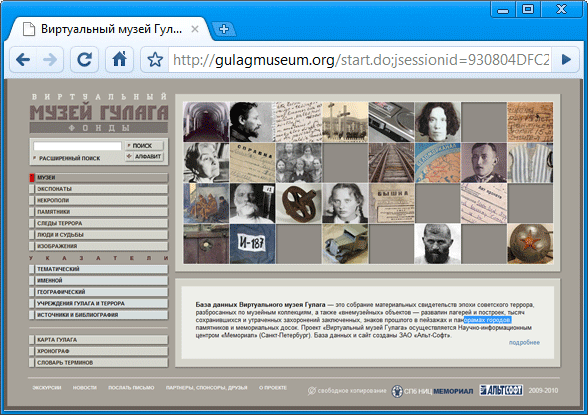 Today, the Gulag Museum is a collection of initiatives by enthusiasts and authors' groups, scattered geographically and disaggregated thematically and methodologically. in different towns and cities of the former USSR, there are a variety of government, agency, community, school, and other museums that are created in their permanent collections of the sections devoted to specific aspects of the topic, specifically collect documentary and material evidence of the history of repression, As well as organize temporary or periodic exhibitions. As a rule, these are autonomous and unrelated initiatives taken by museum collectives. In most cases, these exposures are known only to a limited number of visitors and are not claimed outside the geographically limited community. Nevertheless, the need to comprehend the experience of the Gulag and terror in the generalized museum view continues to be felt as an urgent contemporary problem. Today it is important to understand: all the components of the future museum already exist in reality - these are autonomous initiatives. Complementing, and sometimes contradicting each other, they accumulate experience, which should form the basis of the future Museum. The main question remains - how to add these components to a single semantic whole? How to integrate fragmented knowledge and local understanding into a single historical panorama? The St. Petersburg Memorial Scientific Information Center has been implementing the idea of ​​creating the Virtual Gulag Museum for the fifth year. We view this project as a collection of various museum and exhibition initiatives united in a single virtual space for comparing and finding ways of integration, while at the same time ensuring that the regional and author's specifics are not lost, but enter into a single whole as part of it. The ultimate goal of the project is the creation of the Virtual Museum, which represents both the general picture of the history of terror and the current state of memory about it, in its material embodiment. The "memorial" memory of terror is also an integral part of this picture, and In our collection, it is represented by two separate components: "Gulag Traces" - signs of the past in the landscape and anthropogenic environment surrounding us, and "Necropolis of Terror" - hundreds of preserved, semi-preserved or almost extinct places of burial of victims of terror. The next stage of our project will be the construction of a virtual museum based on the collected collection - with a multimedia presentation of the exhibits, with detailed museum documentation, with a reference device including thematic and other headings, indexes, virtual card files, with thematic expositions, temporary and permanent exhibitions, with the developed System of virtual excursions. The electronic catalog "Engraving in Russia XVIII - the first half of the XIX century." State Museum of Fine Arts. A.S. Pushkin. Reproductions of hundreds of paintings of the museum. The catalog is the first attempt of electronic systematization of the collection. It is planned to make about six hundred works of printed graphics created by famous Russian and foreign artists in Russia for a century and a half made in various techniques. The basis of the catalog is engraved portraits of famous figures of their time and members of imperial families. The catalog is provided with reference books and a convenient search, sections of the catalog contain biographical information about the authors of engravings and persons depicted in portraits, a description of performance techniques, styles of art, genres. The electronic catalog is designed for a wide range of users interested in the history of Russia of the New Time, its culture, fine art in general and the art of printed graph ki in particular.